St Andrews, or Queenstown as it was known at the time, like all the little towns dotted throughout the Shire, had its community hall. Built in 1883, it was known as the Queenstown Mechanics Institute Hall. It was quite common in the early days for public buildings to be relocated as the community’s needs changed, and this was the case with the St Andrews hall. Originally built on the land of Mr Harris near Butterman’s Track, it was moved to the current site in 1889 to be closer to what had become the centre of town. A permit was sort from the Shire of Eltham to remove the railings on the old Queenstown bridge to enable to hall to pass, no doubt hauled on a bullock dray. The Shire condemned the building in 1899, but with drew the order when the walls were lined and the building made a little more comfortable. People familiar with the St Andrews market will be amused to hear that there was a market, if sorts, held in the old hall in 1889 before it was relocated. Locally grown fruit and vegetables were sold by a Chinese market gardener who left the hall in such a mess complaints were made to the Health Department. There is also a rumour that opium was on offer. ​The hall was an important part of community life until 1924 when it was destroyed by fire. There are no known photos of this early hall. It was rebuilt the following year. The earliest known photo of the outside of current hall was taken around 1965 by Alfred Weeson. A slightly earlier photo of the interior taken at a dance in the 50s shows a very different hall to the one we know today. The walls and ceiling weren’t lined. The front door resembled a barn door, and rough bench seating ran around the walls. ​There was a bush dance held in one of the local halls every weekend. St Andrews would be the host one week, then Panton Hill, Hurstbridge, Arthurs Creek and Strathewen would have their turn. The band was made up of local talent. As there was no power in the town, a large iron hoop with hooks for kerosene lanterns was suspended from the ceiling and could be lowered and raised. On some occasions, one of the locals supplied his car battery for lighting. A supper of sandwiches was provided, and a big pot of boiling water hung over the fire place in the kitchen for tea and coffee. January 1962 saw the town of St Andrews engulfed by fire. Many lost their homes, but the hall, pub, old church and school were saved. Later that same year the power came to St Andrews and the community celebrated the big occasion with the Switch On Ball. 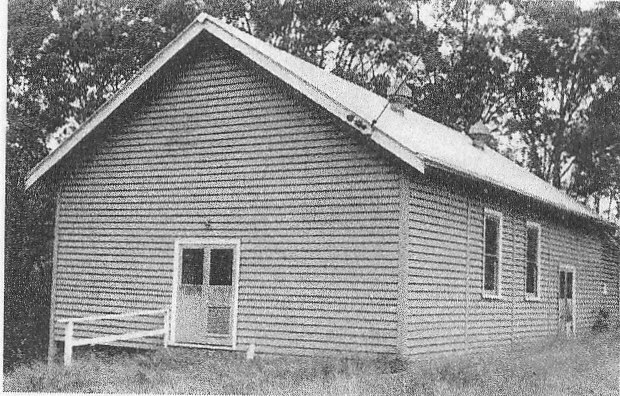 By 1964 the bush dances had ceased and regular community gatherings at the hall became a thing of the past. It wasn’t too many years later, in 1972, that a handful of local artists and musicians came up with the idea of an open air market to be held in the reserve in front of the hall. Once again, the hall was to become the meeting place for the community. Moon Dances were held every month and, for a while, mums with children at the Primary School screened films for the kids and their parents. The hall was also the meeting place for the St Andrews cubs. There was still no insulation in the roof and no heating, so every one rugged up well in winter. In Summer the doors and the two small high windows on the North wall were opened, but it could be very hot and uncomfortable. The verandah on the South wall was added in the 1970s, and in the 1990s the ceiling was insulated and boxed in. The original septic system was replace in 2007 with an environmentally sensitive system which recycles the water, and 2015 saw solar panels installed on the roof. ​The biggest change in the life of the hall came in 2008. The previous year, the Hall and Reserve Advisory Committee had supported a suggestion that the two small North facing windows be replaced with expansive glass doors opening onto a big deck. The possibility of replacing the very small and inadequate kitchen was also raised . A brass plaque on a rock in front of the hall marks the celebration of the completion of the upgrade and landscaping in 2008. The bricks from the old kitchen chimney were saved, and a seat was built by volunteers in front of the new kitchen. There is an explanatory plaque on the side of the seat. Many events were held in the hall after the fires to help the community recover. 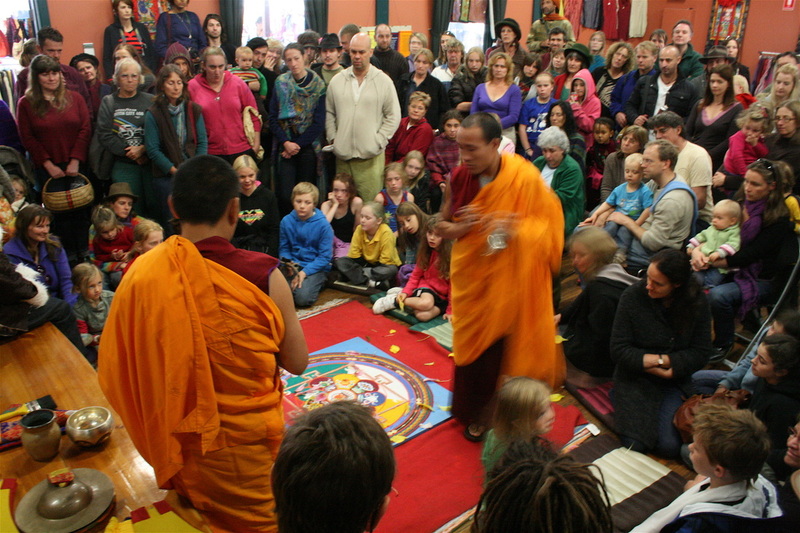 The Buddhist monks created a mandala, an aboriginal dance troop came from the N.T. and performed on the brick circle, and many different musicians offered their support and entertained the community. The play “Hero of Queenstown” was to have started it’s season on the 11th February but was postponed till May. The beautiful mosaic seat nestled in it’s quiet spot below the deck is a gift to the community created by the Lasting Memories Mosaic Group. These women came together after the fires to comfort and support to each other. It was completed in 2012. 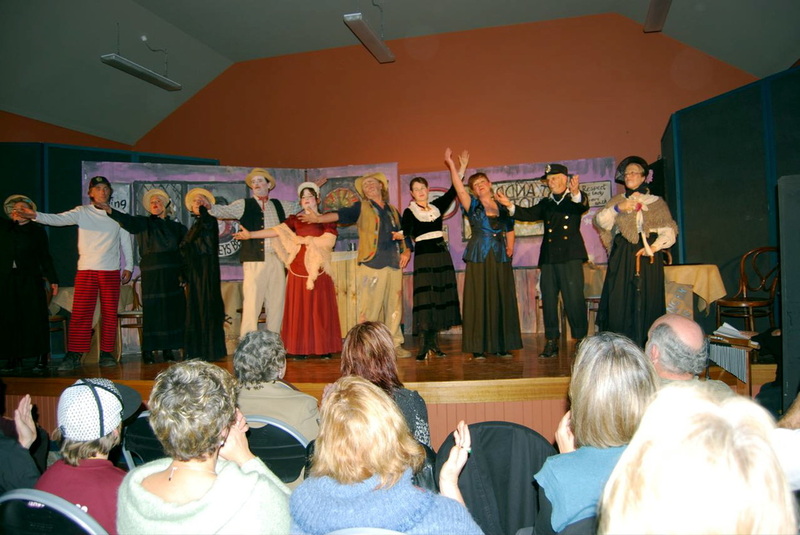 Now that the hall is more comfortable and attractive it has become a popular venue for many more activities. It is used on a weekly basis for yoga, t’ai chi and creative dancing. The three Film Society groups use it every month, and people are choosing to celebrate special occasions like weddings and birthdays there. It continues to be used for community meetings, and market stallholders make use of the space every Saturday. From it’s earliest days a Hall Committee managed the hall and bookings. Then in 1998 the Hall and Reserve Advisory Committee was created to managed hall and the surrounding reserve on behalf of Nillumbik Council. 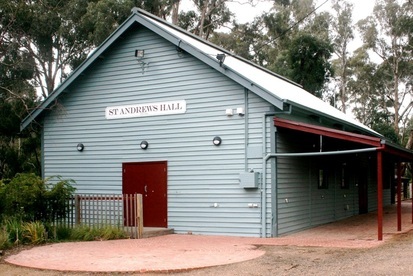 In 2013 it was decided to bring the St Andrews Community Centre and St Andrews Hall under the one management. Page written by Pat Reynolds. Thanks go to the St Andrews Historic Society for providing the historic information. Also, thanks to Barry Tucker for the memories of the early dances at the hall.